Most of the time it feels like our little family of three — my kiddo, my husband and me — is living inside a tornado. Our days and weeks feel like a whirlwind of work, school, activities, dinners, breakfasts, and events, and often it feels like a race that leaves us winded and exhausted. I’d love for us to have more time to chill out and catch our collective breath, but since that’s not always possible what I try to do instead is to come up with tiny traditions that can anchor and stabilize our crazy busy days. They’re nothing fancy or complicated — just simple tricks to turn regular moments into memorable ones. Doing this makes the ordinary just a little more extraordinary, and ensures that our daily race to the finish line always has a few meaningful pauses in it. When my husband travels, my daughter and I have “civilized mornings.” We put on classical music, make a nice breakfast, drink some tea, and sometimes even speak with a British accent. It’s our little girls’ tradition and it makes a hectic morning a bit more, well, civilized. Every morning I write a little note and put it in my daughter’s lunchbox. I take a few seconds to think of something to thank her for or to tell her whatever it is that I’m looking forward to us doing that weekend. It’s my little gratitude ritual every morning and I know it’s something she looks forward to at school. By the time we all get home on Friday night we’re exhausted, so cooking is out of the question. We get takeout and have a picnic while we watch a movie in the living room. It’s like a big collective family exhale. On Sunday nights I cook up a storm for the coming week — I make and prep dinner for four days ahead. So for dinner that night we have our very official “random dinner.” Sometimes it’s leftovers. Sometimes it’s breakfast for dinner. Sometimes it’s really just a collection of random stuff we find in our fridge. It’s low-key and relaxed and it lets us finish out the weekend on a spontaneous note. 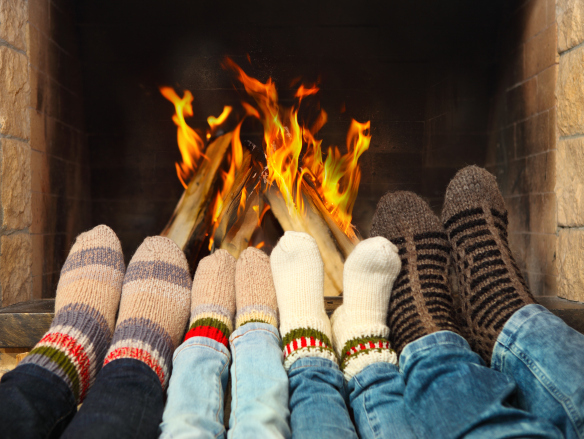 Do you have a tiny family tradition you love? Share it in the comments for inspiration!